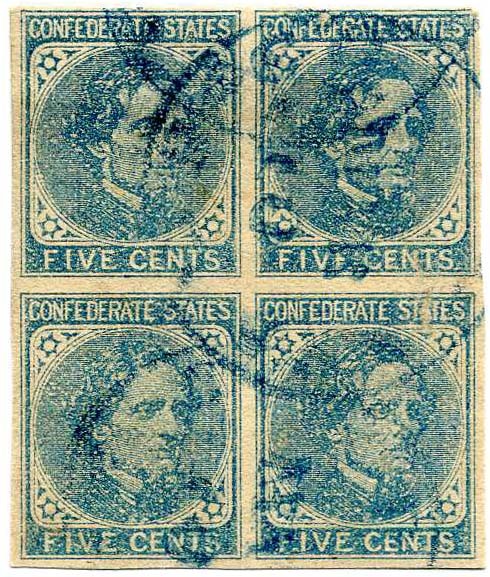 CSA 7, 5¢ blue horizontal strip of 4 canceled with 4 strikes of Army grids, prior dealer had this listed as London Paper, but I don't believe this to be so, SCV for a block of 4 is $350. 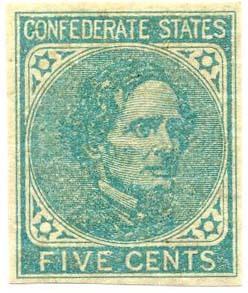 CSA 7-L, 5¢ dark blue on London Paper, used with red town cancel, tiny thin otherwise Fine, Ex-Hall (1925 sale - C.J. Phillips), SCV $120. 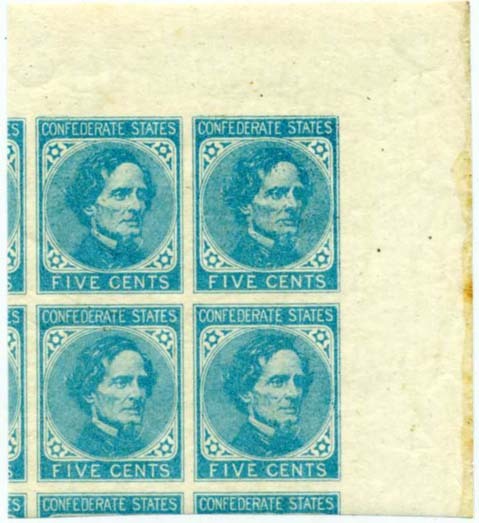 CSA 7-L, 5¢ blue, upper right corner margin block of 4, original gum, never hinged, Superb. $200. 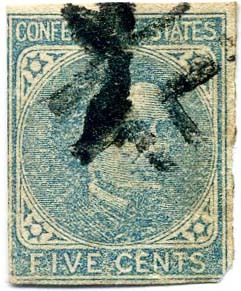 CSA 7-L, 5¢ blue, lower right corner margin block of 4, original gum, never hinged, light gum stains. $150. 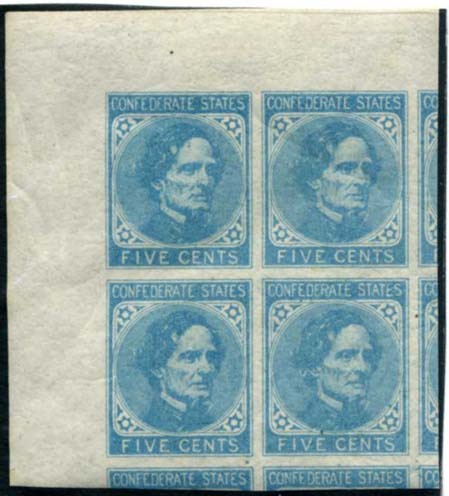 CSA 7-Lb, 5¢ dark blue, upper left corner margin block of 4, original gum, never hinged, light gum stains $150. 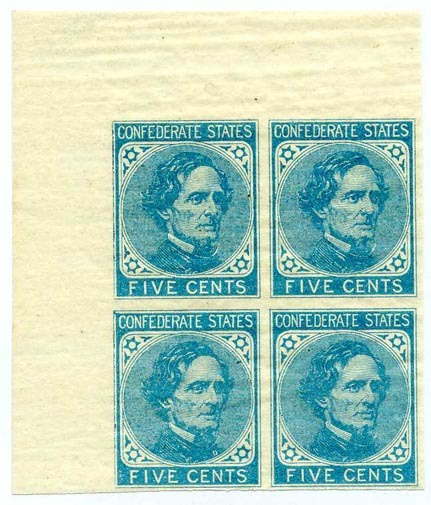 CSA 7-L, 5¢ blue block of four, usual disturbed full original gum, never hinged, Very Fine. $100. 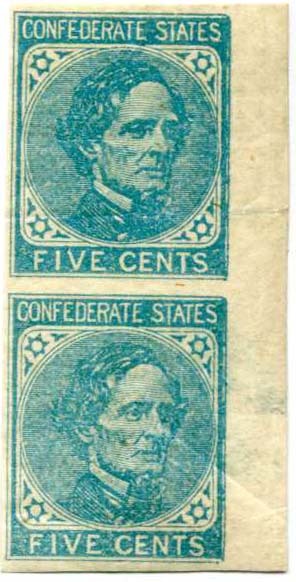 CSA 7-Lv4, 5¢ blue vertical right sheet margin pair, positions 39 / 49 with FILLED-IN FRAME at right, full original gum, bottom with hinge remnant, top never hinged, crease in top stamp, very collectible, CCV $70+ $60. 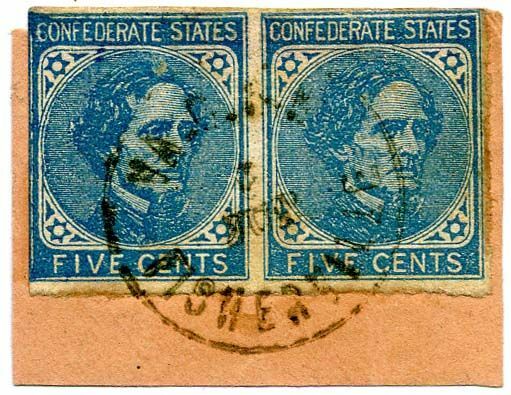 CSA 7-R, 5¢ blue pair tied on small piece by WARTRACE N. & C. R. R. oval railroad cancel, Scarce and popular, THICK LOCAL PAPER, CCV $1,000 on cover, SCV $295. $200. 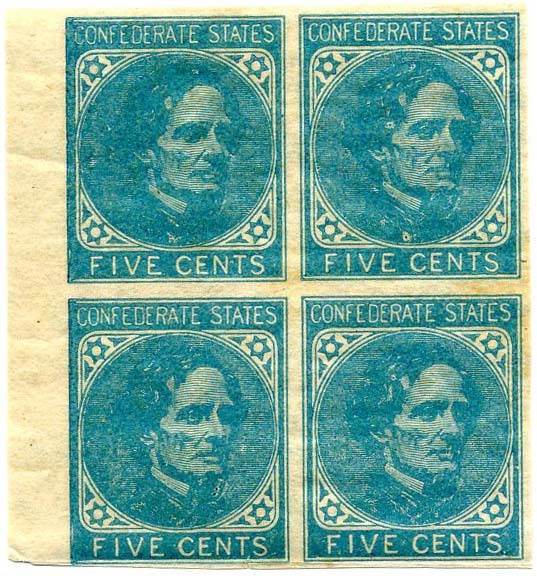 CSA 7-L, 5¢ blue block of four, original gum, never hinged, Very Fine, SCV $110+ as singles. $130. 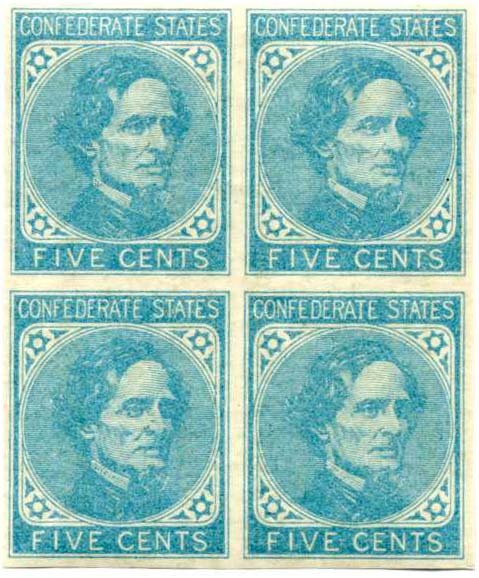 CSA 7-L, 5¢ blue block of four, original gum, never hinged, Very Fine, SCV $110+ as singles. $120. 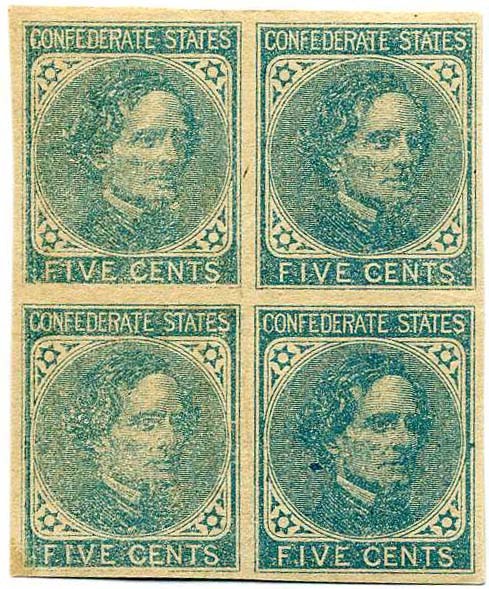 CSA 7-L, 5¢ blue lower left corner block of four, original gum, never hinged, Very Fine, SCV $110+ as singles. $200. 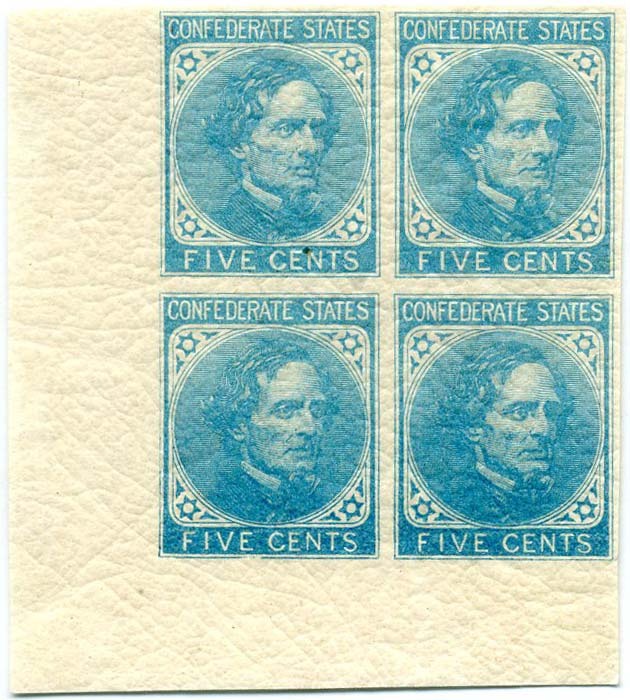 CSA 7-L, 5¢ blue top sheet margin block of 4, original gum, stamps never hinged with hinge remnant in upper left margin only, Superb, 2013 SCV $95. $150. 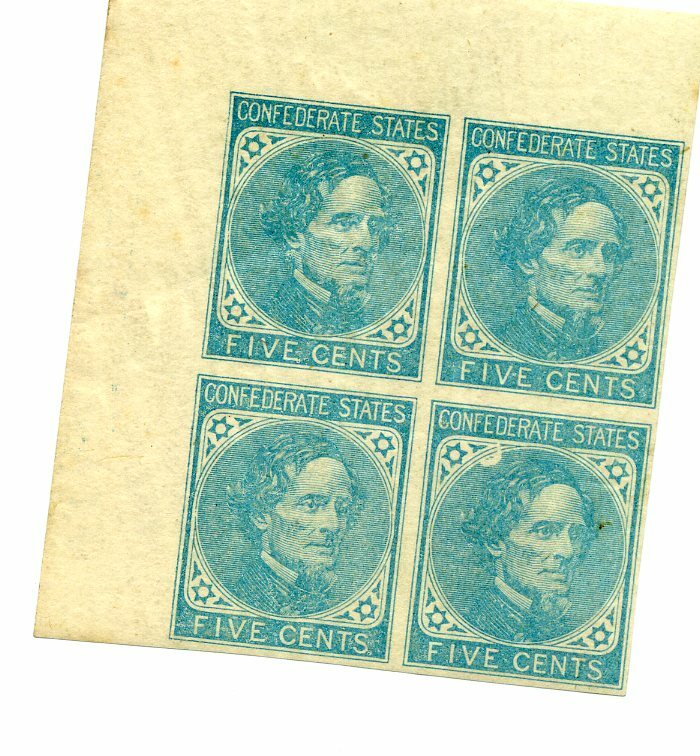 CSA 7-L, 5¢ blue strip of four with printing flaw on 2nd stamp from the left, used with double strike of RICHMOND / Va. cds, CCV for a block of 4 is $275. $250. 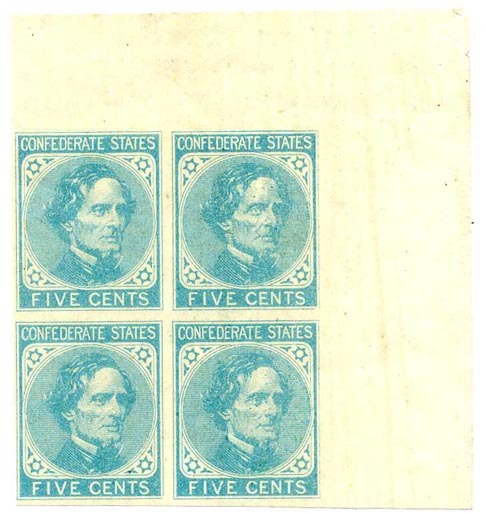 CSA 7-L-v4, 5¢ blue left sheet margin with FILLED-IN FRAME varieties, original gum, never hinged, Very Fine, CCV $35 per single variety plus pair. $140. 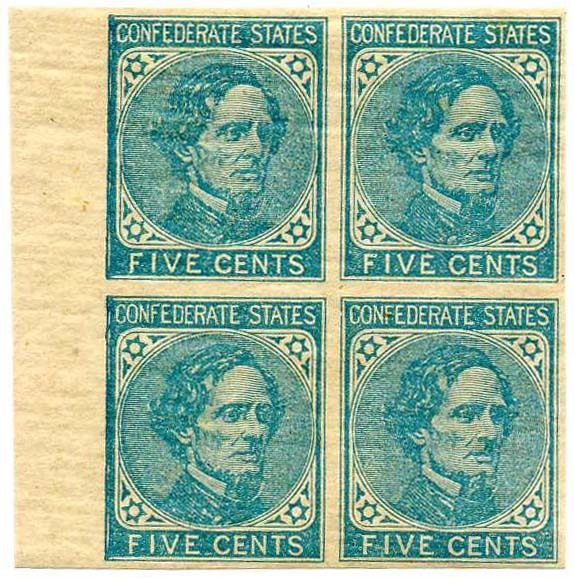 CSA 7-L-v4, 5¢ blue bottom right corner margin with FILLED-IN FRAME varieties, original gum, never hinged stamps with very light hinging in margin only, Superb, CCV $35 per single variety plus pair / premium for corner block. $180. 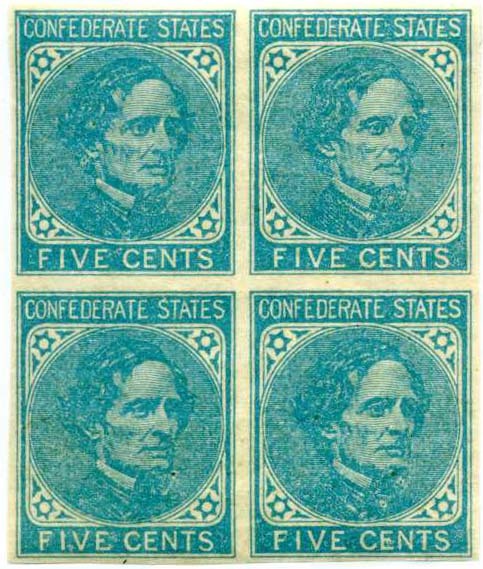 CSA 7-L-v4 and CSA 7-L-v5, 5¢ blue upper left corner margin with FILLED-IN FRAME varieties, original gum, never hinged, Superb, CCV $35 + $150+ $250. 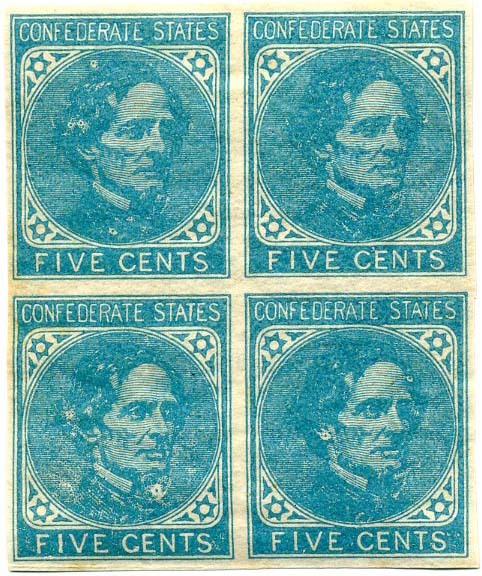 CSA 7-R-v8, 5¢ blue block of 4 on thick local paper with SHORT TRANSFER at bottom on left two stamps, no gum, pressed creases, CCV $200 as regular block plus variety. $300. 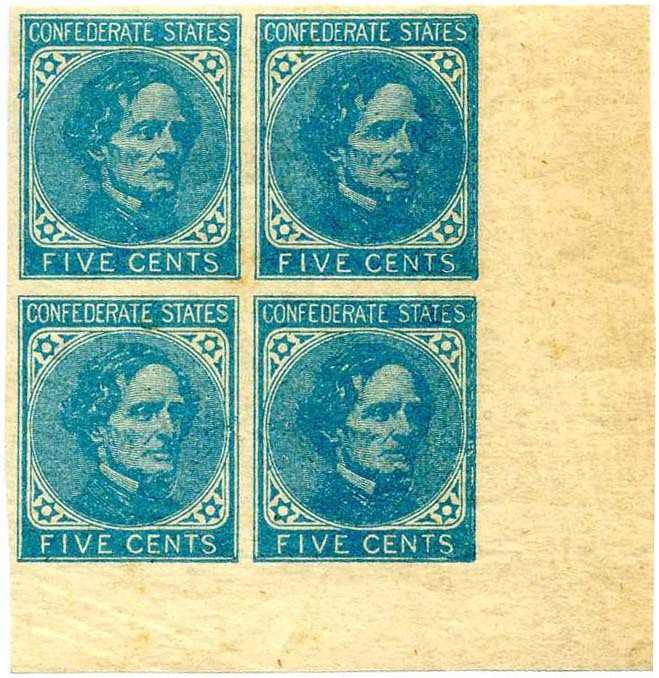 CSA 7-R, 5¢ blue used block of 4, with triple strikes blue COLUMBIA, SC town cancel, wonderful used block, SCV $428. CCV $600 including premium for blue cancel. THICK LOCAL PAPER $450. 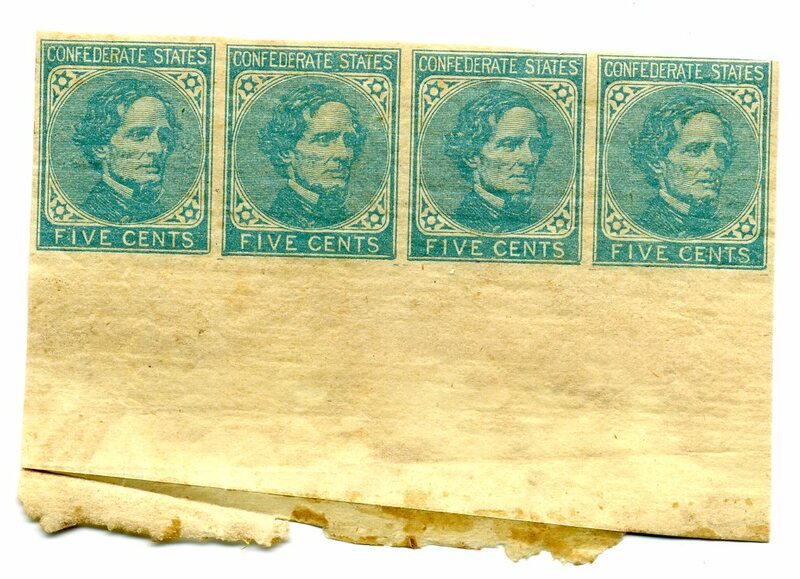 CSA 7-R, 5¢ blue block of 4, THICK LOCAL PAPER used with bold RICHMOND / Va. // MAR / 19 cds, tiny 2-mm edge tear in upper left stamp,SCV $400+, CCV $500. $300. 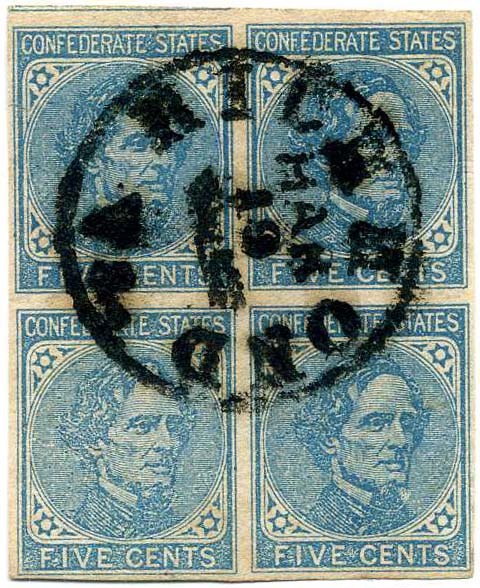 CSA 7-R, 5¢ blue local print used with bold oval RAILROAD cancellation WARTRACE / N. & C.R.R. (Nashville and Chattanooga Railroad), Scarce! THICK LOCAL PAPER CCV $1,000 on cover, SCV $295. $250. 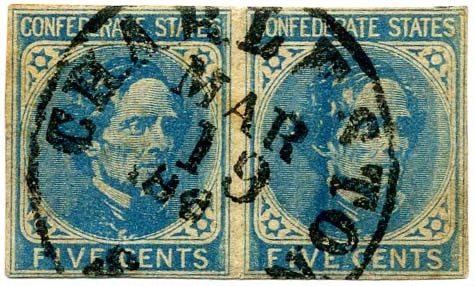 CSA 7-R, 5¢ blue, 4 margins, used with incredible bold strike of ESTELLE SPRINGS / N.&C.R.R. // MAR / 1863 oval, small faults, Extremely Fine appearance, Ex Powell, Quite Scarce, THICK LOCAL PAPER, CCV $1,500 on cover. 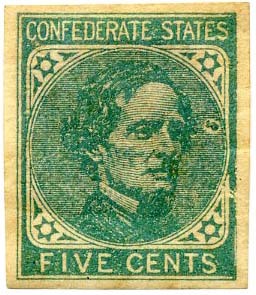 SCV $295. $200. 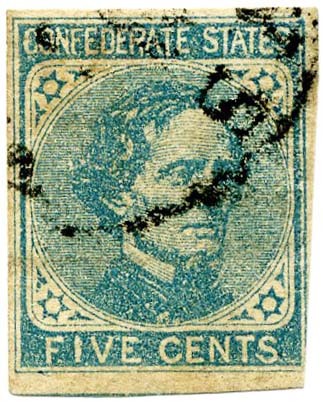 CSA 7-R-V2, 5¢ blue pair with filled in frame variety at left, used with beautiful strike of FISHERVILLE VA.C.R.R. railroad oval on piece, THICK LOCAL PAPER, CCV $750 on cover, SCV $295. Ex Powell. $200. 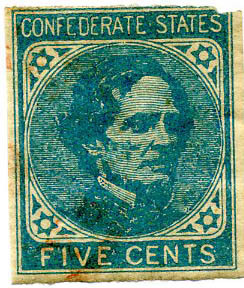 CSA 7-R, 5¢ blue used with fancy MOUNT CRAWFORD VA CROSSROADS cancel, CSA Catalog #AC-09 (CCV $250), trace of adherence on verso. 2012 CSA certificate for pair accompanies. Quite Scarce. Ex Canestro. $275. 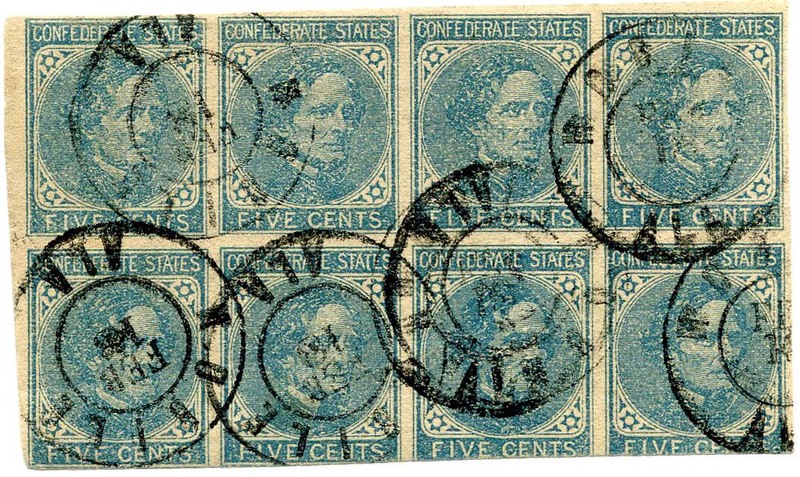 CSA 7-R, 5¢ blue on local paper, used block of eight, canceled by bold neat strikes of MOBILE / ALA // FEB / 18 double-circle datestamp, significantly scarcer as a used block, SCV as two used blocks of four $700 with no regard for Richmond paper which catalogs double the price for singles so extrapolates to $1,400. 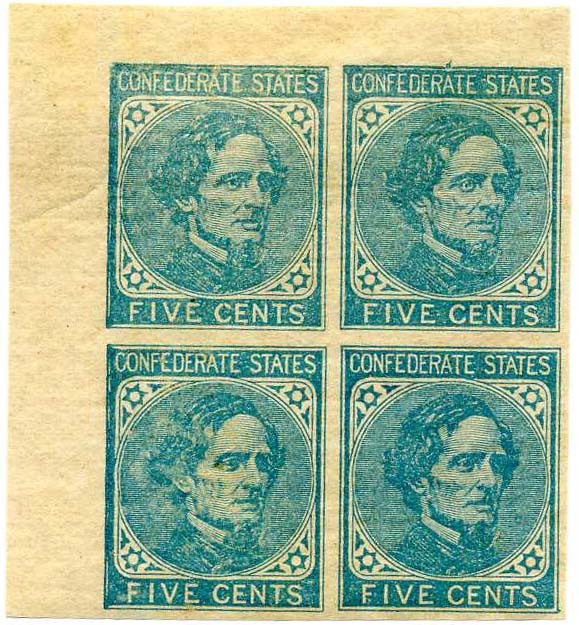 A used block of 4 in the CSA Catalog is valued at $500, thus $1,000 for block of 8. Pressed creases, fresh. Quite desirable. $850. CSA 7-L, 5¢ blue pane of 100, full original gum with usual gum crazing, some creasing and several edge tears at right with archival tape reinforcement–a few a bit into 3 stamps, fresh and bright. Please note that the side margins are slightly larger than portrayed as the scanner cut off a small portion of the sides. $1,000. 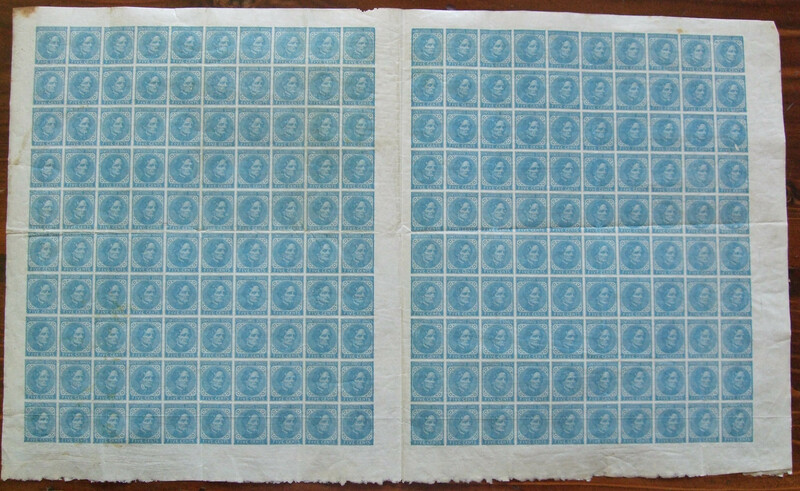 CSA 7-L, 5¢ blue DOUBLE PANE OF 200 (upper half sheet) showing White Tie Variety (position 30 UR) and ten sets of gutter pairs with filled in frames as well as a few other an UNLISTED BRASS RULE AT RIGHT in the sixth, seventh and ninth rows. 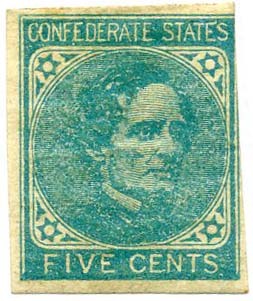 This is listed in the CSA Catalog only as existing on the top row. Clearly, that is not the only location, nor is it logical that it should be only on the top. This will be the topic of an article joint article by Kevin Andersen and Trish Kaufmann in the 1Q 2019 issue of the CP. With full original gum that has never seen a hinge—even in the margins—fresh with excellent color due to complete protection from light, usual edge faults and gum creasing usually found on large multiples, as well as gum staining at upper left and few spots at bottom. 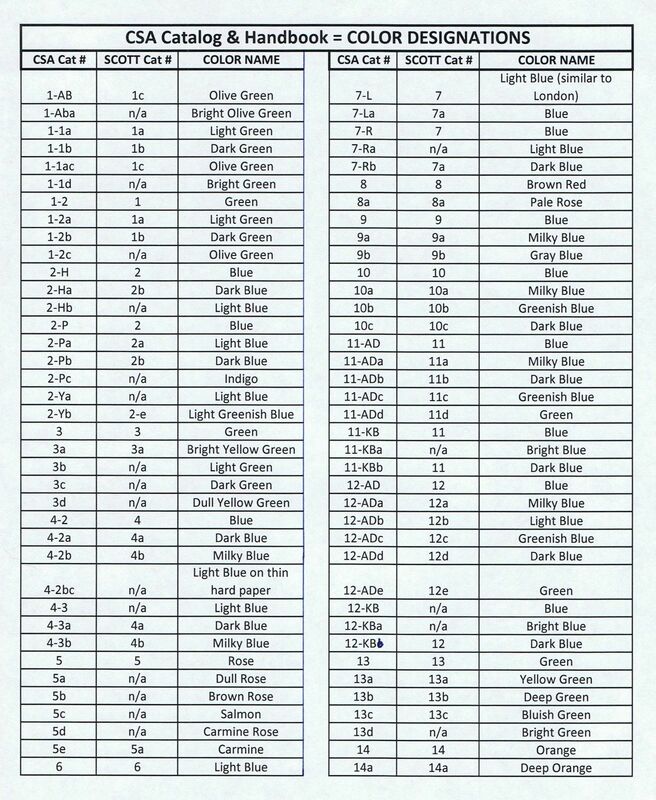 Hand-held camera photo is fuzzy but the impression is not, Catalog Value well exceeds $6,000; Brass Rules are only now being studied to any real degree. $4,000. 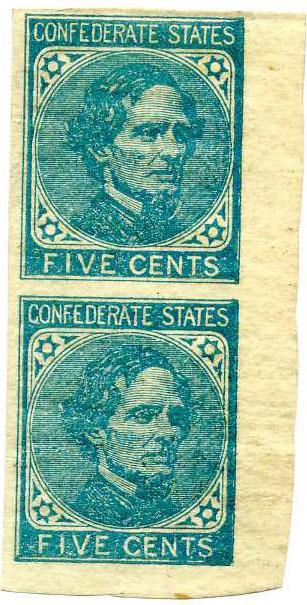 CSA 7-R, 5¢ dark blue PANE OF 100 (lower left) on thicker LOCAL PAPER showing FILLED IN FRAMES on full right column (gutter column) of stamps. Richmond paper is easily twice as rare as London paper, if not more, especially in large multiples. Full original gum, mostly never hinged, tear in left margin only which is supported by archival tape, pin holes in right margin, minimal creasing for its size. Catalog value well exceeds $4,000 just as singles, much more as blocks, and should be roughly double premium for never hinged not taken into account - thus more realistically putting it well over $8,000 in catalog value. VERY RARE MULTIPLE. $4,000. 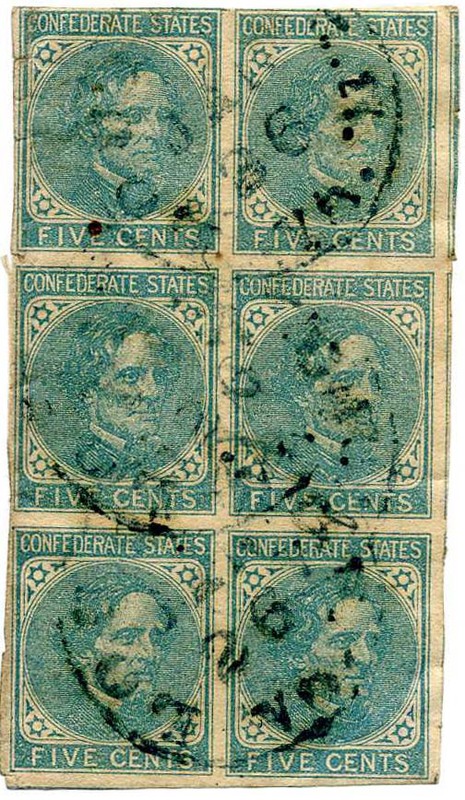 CSA 7-L, 5¢ blue PANE OF 100 (upper right pane) showing Dent in Frame Variety (position 10 UR), thickly applied full somewhat yellowed original gum with a couple hinges on the back in the margins, more hinges on the front edges than the back—visible in the scan, usual edge faults and creasing commonly found on large multiples. Well over $2,000 in catalog value only as singles without premium for blocks and varieties. $1,500. 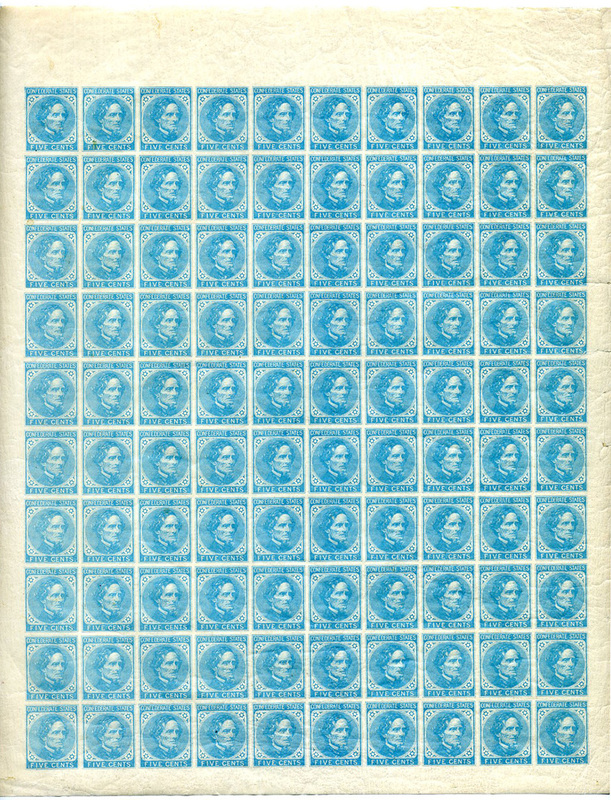 CSA 7-L, 5¢ blue double pane of 200 (upper half sheet) showing White Tie Variety (position 30 UR) and ten sets of gutter pairs as well as a few other transient errors (ink spots), full original gum that has never seen a hinge—even in the margins—pristine with excellent color due to complete protection from light, usual edge faults and gum creasing usually found on large multiples, hand-held camera photo is fuzzy but the impression is not, Catalog Value well exceeds $6,000; Rare and desirable – a stellar example. $4,500. 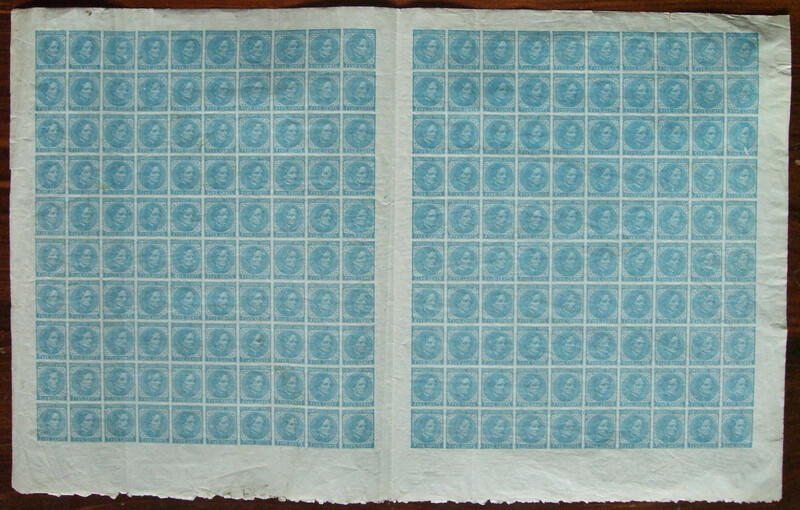 CSA 7-L, 5¢ blue DOUBLE PANE OF 200 (upper half sheet) showing White Tie Variety (position 30 UR) and ten sets of gutter pairs as well as filled in frames and a few other transient errors (ink spots), full original gum that has never seen a hinge—even in the margins—clean sheet with excellent color due to complete protection from light, usual edge faults such as small tears and creasing usually found on large multiples, hand-held camera photo is a bit fuzzy but the impression is not, Catalog Value well exceeds $6,000; Rare and desirable. $4,000. 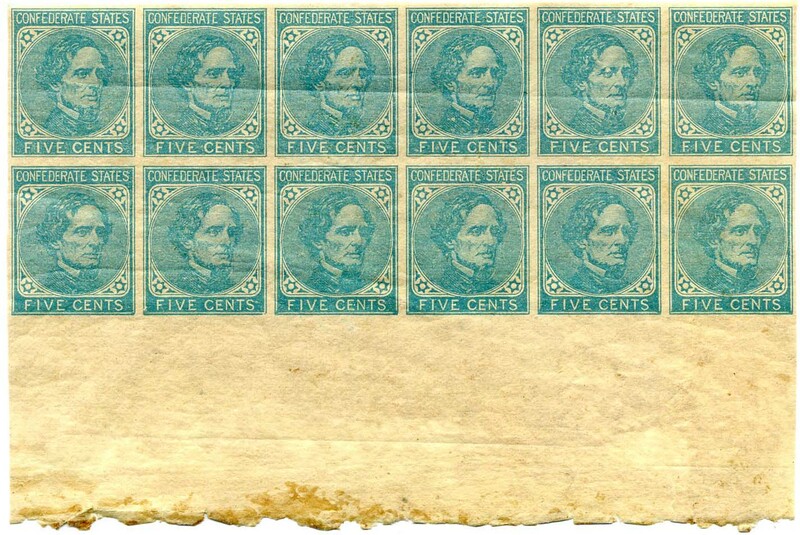 CSA 7-L-variety, 5¢ blue bottom sheet margin strip of 4 showing BRASS RULES in 5 places in the 1 mm positions, original gum, never hinged, Unlisted with brass rules in any but top position. RARE! $300. 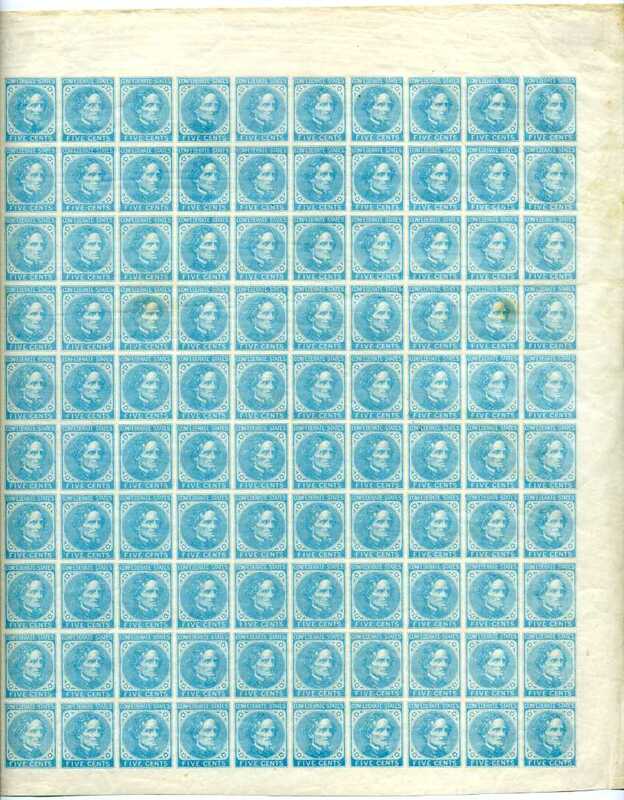 CSA 7-L-variety bottom sheet margin block of 10 with BRASS RULES at bottom in two places, original gum, never hinged, Very Fine, unlisted in any but top position. $500. 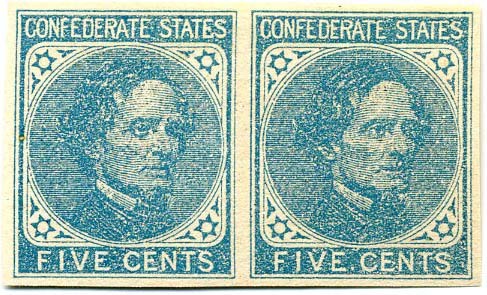 CSA 7-L-v4, 5¢ blue pair, used with neat Raleigh, NC double datestamp, right stamps with FILLED IN FRAME variety, CCV $55 as singles. $50. 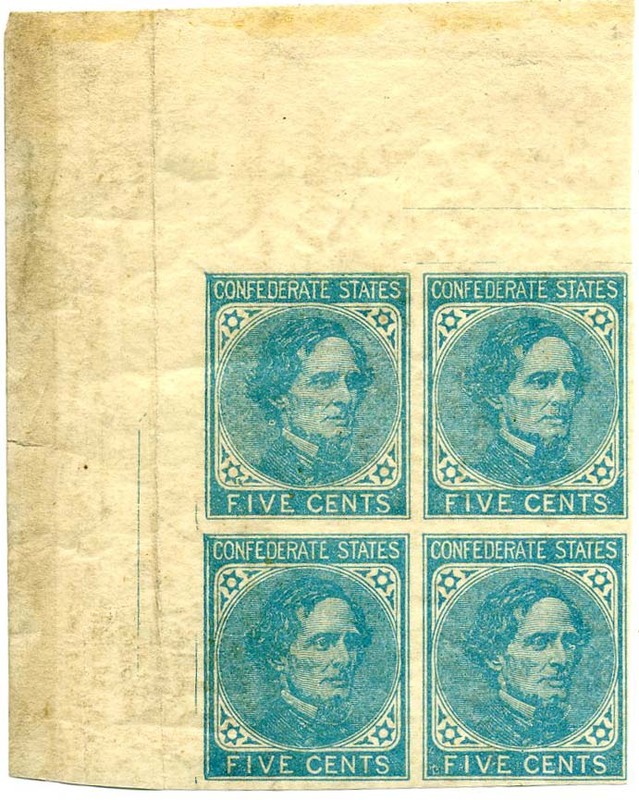 CSA 7-L, 5¢ blue block of 4 on De La Rue paper, original gum, never hinged, Very Fine, SCV $100 as hinged. $150. 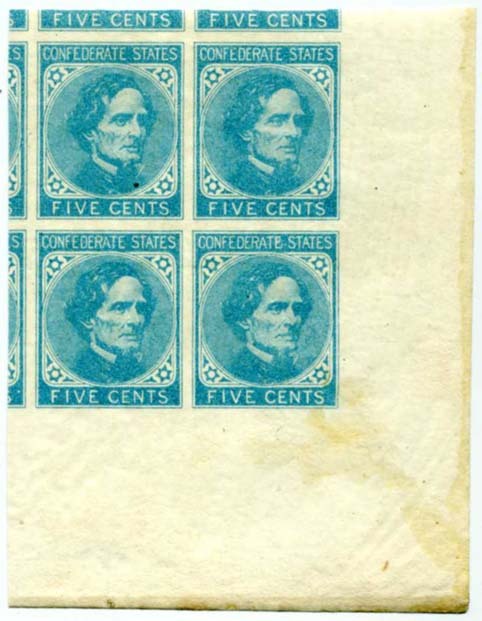 CSA 7-L, 5¢ blue left sheet margin block of 4 on De La Rue paper with FILLED IN FRAMES on two left stamps (CC 7-L-v4), original gum, never hinged, Very Fine, SCV $100 as hinged. $200. 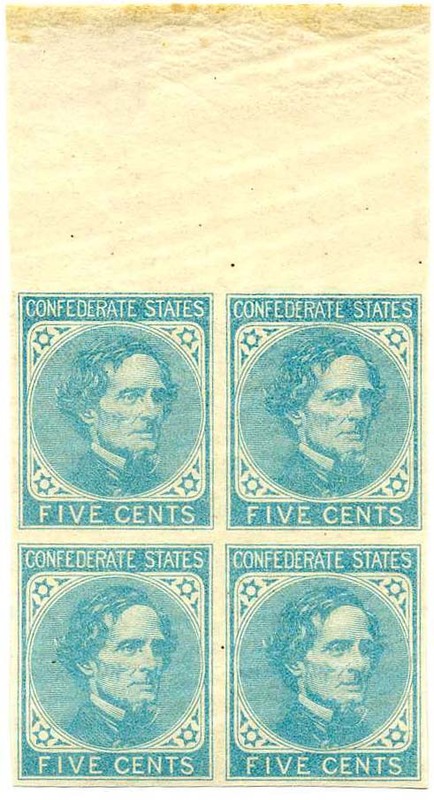 CSA 7-Rb, 5¢ dark blue lower left sheet margin block of 4 on LOCAL paper with FILLED IN FRAMES on two left stamps (CC 7-L-v4), no gum, crease across top pair otherwise Very Fine, SCV $200+, SCV $160 as singles alone. $150. 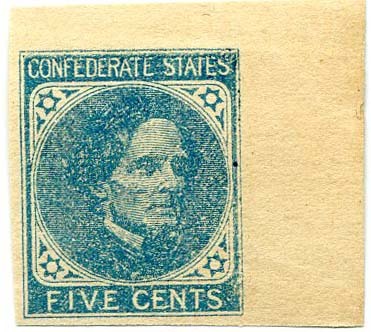 CSA 7-Rb (Scott 7a), 5¢ dark blue on THICK LOCAL PAPER used with Richmond cds, heavily thinned, Ex Cox, SCV $45. $10. 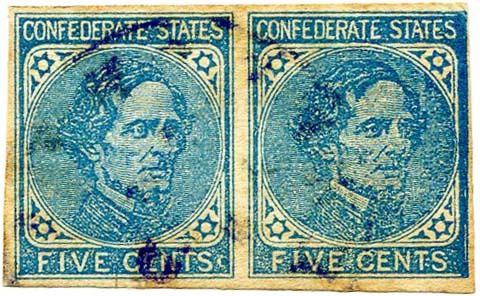 CSA 7-L, 5¢ blue vertical pair local print on De La Rue paper, original gum, never hinged, Very Fine, SCV $40 for hinged. $80. 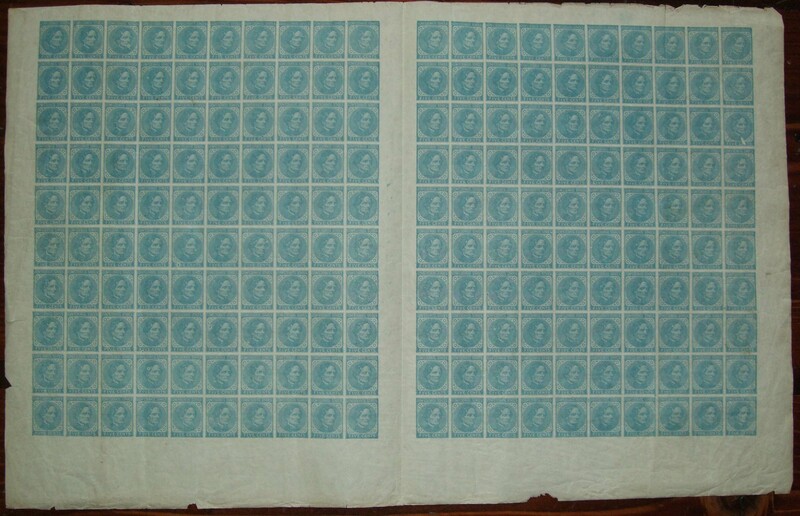 CSA 7-L, 5¢ blue bottom sheet margin single on De La Rue paper, original gum, never hinged, Extremely Fine, SCV $20 as regular hinged single. Pretty! $45. 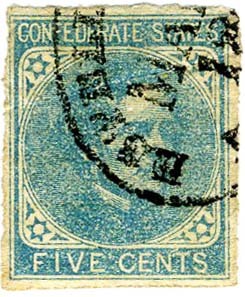 CSA 7-L, 5¢ blue left sheet margin single on De La Rue paper, original gum, never hinged, slight gum ridge and tiny inclusion speck otherwise Extremely Fine, SCV $20 as regular hinged single. $35. 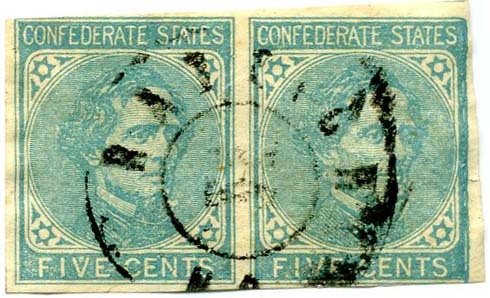 CSA 7-R, 5¢ blue pair on THICK LOCAL PAPER, unused (no gum), Superb, SCV $80 as singles, CCV $90 as singles. $75. 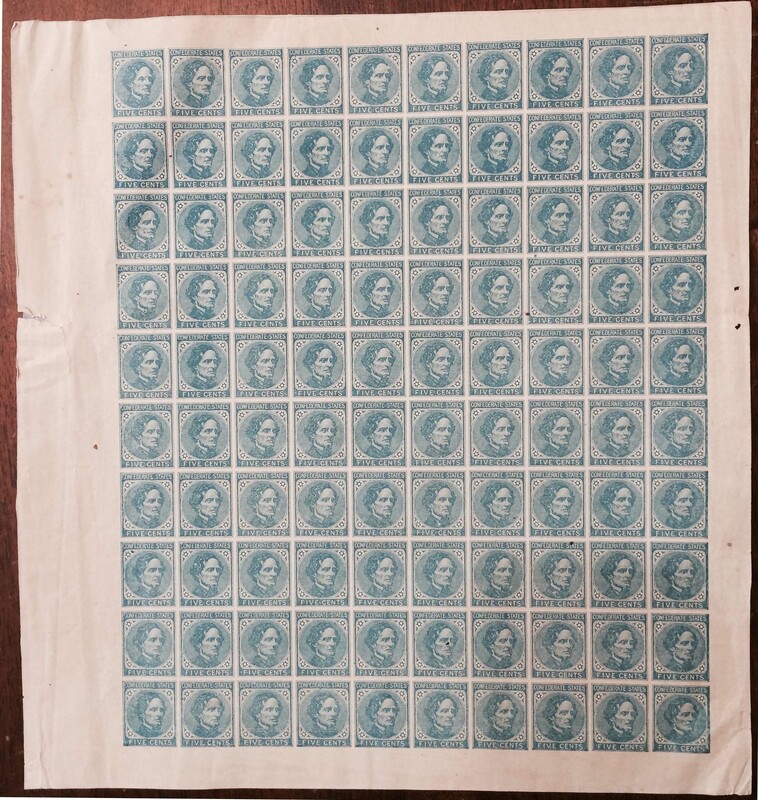 CSA 7-L, 5¢ blue bottom sheet margin on De La Rue paper, original gum (bit of gum creasing), never hinged, Very Fine. $45. 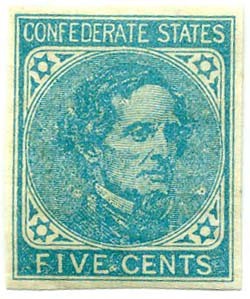 CSA 7-L, 5¢ blue on De La Rue paper, unused (no gum), Very Fine, SCV $22. $20. 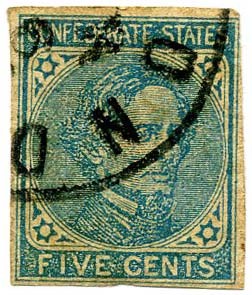 CSA 7-L-v7, 5¢ blue on De La Rue paper with transient printing variety on right shoulder, traces original gum, hinge remnant. $30. 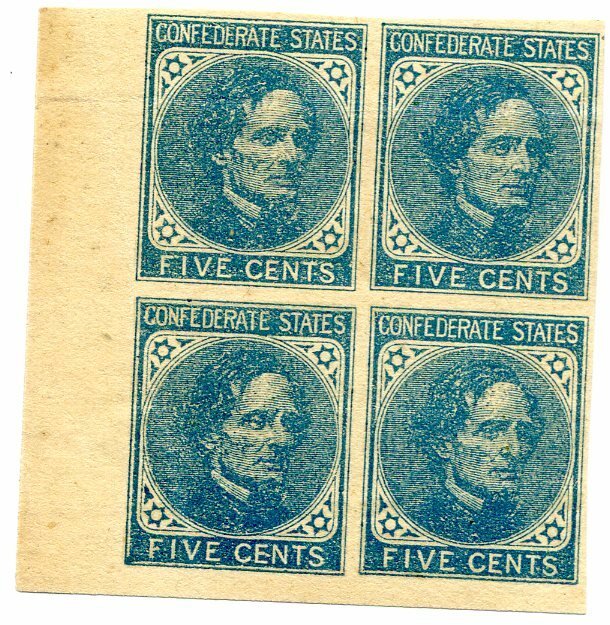 CSA 7-L, 5¢ lower left corner margin block of 4, crazed full original gum, very lightly hinged, few tiny gum inclusions, lovely position piece, SCV as block of 4 $100. $110. 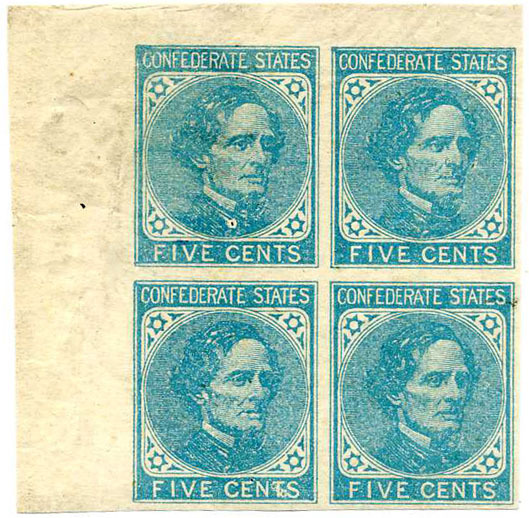 CSA 7-L-v7, 5¢ light blue upper left corner block of 4 with white semi-circle transient printing flaw variety on lower right stamp, original gum, very lightly hinged in margin only, Extremely Fine. $120. 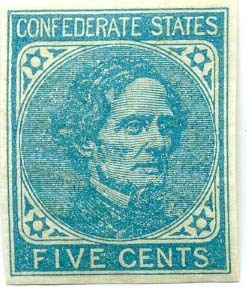 CSA 7-L, 5¢ blue on London Paper, FRAME FILLED IN at right, slight transient ink spot variety on lips as well, original gum, very lightly hinged, crease across top edge otherwise Very Fine, CCV $35. $25. 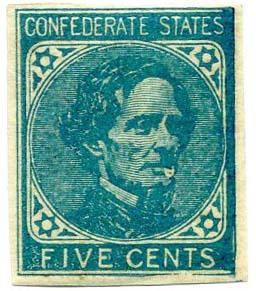 CSA 7-L, 5¢ blue on London Paper, original gum, never hinged, Very Fine+, SCV $20 as hinged. $40. 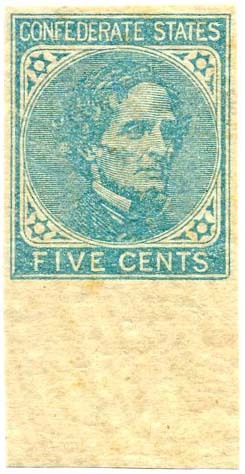 CSA 7-L, 5¢ blue on London Paper, original gum, never hinged, Very Fine, natural vertical gum crease causing slight print variety on face, SCV $20 as hinged regular stamp. $20. 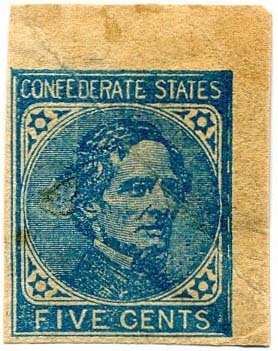 CSA 7-L, 5¢ blue on London Paper, slight transient printing variety (spot in hair), original gum, never hinged, Very Fine, SCV $20 as hinged regular stamp. $40. 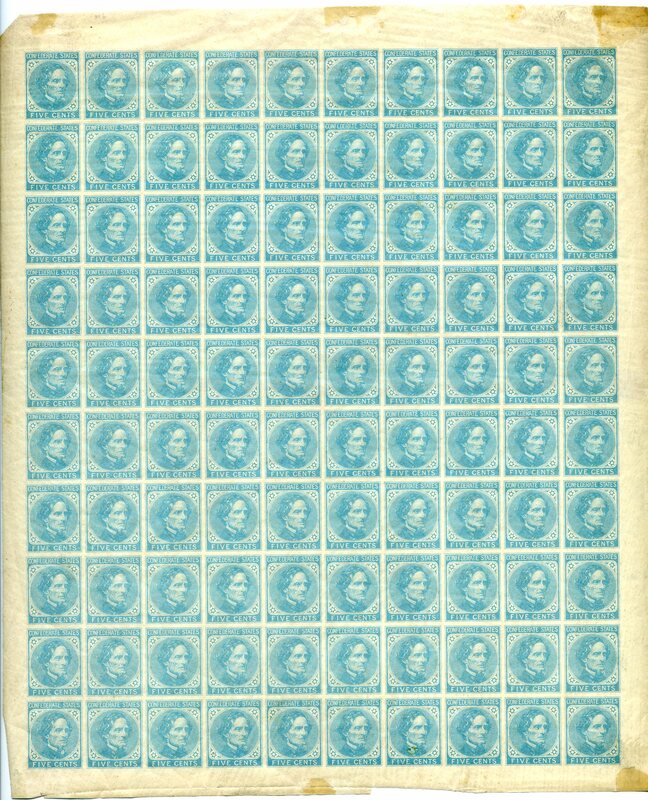 CSA 7-L, 5¢ blue full top right pane of 100 (UR pane of 400 subjects with CSA 7-L-v3, DENT IN FRAME variety which only occurs once in 400 stamps) with full original gum, stamps never hinged but light hinge remnants or traces thereof in the corner margins only, very trivial natural gum wrinkling and one stamp with light gum stain, excellent condition for a large multiple. Full pane would not fit on the scanner bed so the 5/8” margin is cropped in the scan, but not on the sheet itself. Large multiples such as this are getting rarer as they are being broken up over time. CCV for dent in frame $125 + singles at $25@ = $2,600. CCV as the variety plus singles with no premium for pane or never hinged. $1,500. 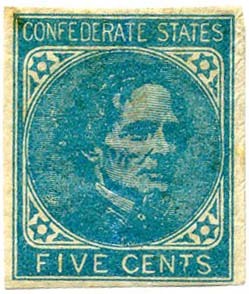 CSA 7-L, 5¢ blue, original gum, lightly hinged, Very Fine-Extremely Fine. $30. 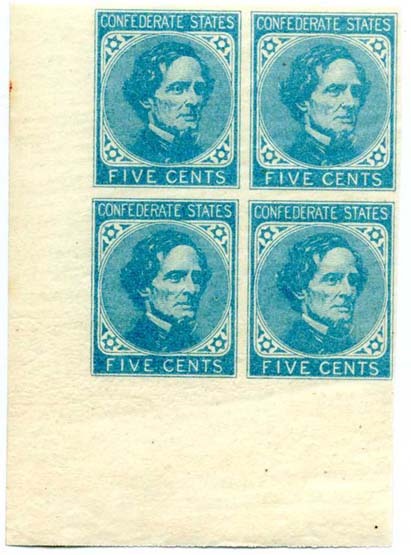 CSA 7-R, 5¢ blue used block of 6 with triple strike of dark blue LOUISA C.H. / Va. // JAN / 26 postmarks, small faults, CCV $690 as block and pair. $250. CSA 7-R-v2, 5¢ dark blue FILLED IN FRAME variety on right stamp of pair with unidentified VIOLET cds, soiling and corner creasing at upper right, CCV $75 for non-variety pair, CCV $35 for variety single, violet not listed in CSA catalog, SCV for violet but no variety is $158. $50. 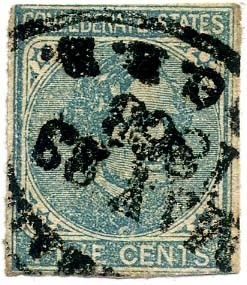 CSA 7-L, 5¢ blue, full original gum, usual natural gum ripples, Very Fine. $35. 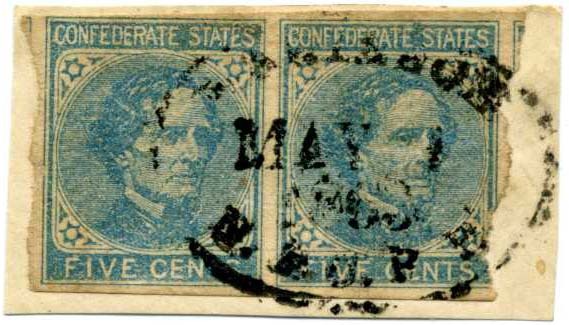 CSA 7-L-v4 right sheet margin pair with FILLED IN FRAME at right, original gum, very lightly hinged, light natural gum bends, Very Fine. Nice pair showing the normal and the variety. 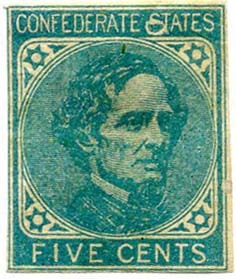 CCV $55. $50. 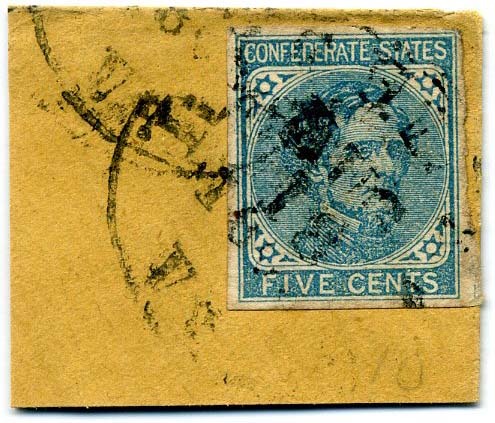 CSA 7-L-v4, FILLED IN FRAME at right, original gum, light crease otherwise Very Fine, CCV $35. $20. 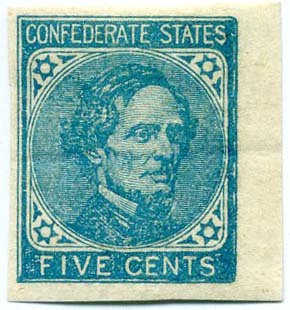 CSA 7-R, 5¢ blue on THICK LOCAL PAPER, used with neat unidentified cds, 4 margins, Very Fine. $45. 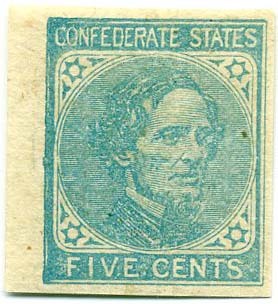 CSA 7-R, 5¢ blue on THICK LOCAL PAPER, used with manuscript cancel, crease at top, Very Fine appearance. $25. 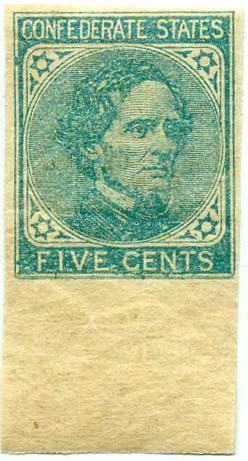 CSA 7-R, 5¢ blue on THICK LOCAL PAPER, used with manuscript cancel, creasing at top, particularly at UR corner, 4 margins. $15. 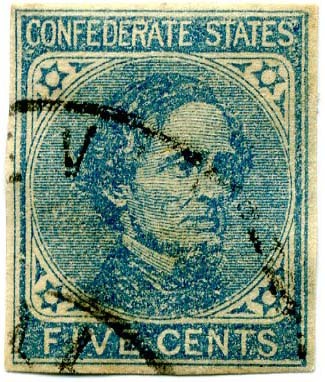 CSA 7-R, 5¢ blue on Richmond paper, used with ESTELL[E SPRINGS, / N.&C.R.R. / MA- / 18—RAILROAD OVAL of Nashville & Chattanooga Railroad, creasing, Cat. Val. on cover in CSA Catalog is $1,500. 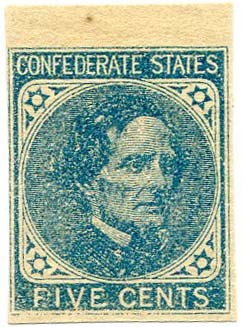 SCV $295. $170. 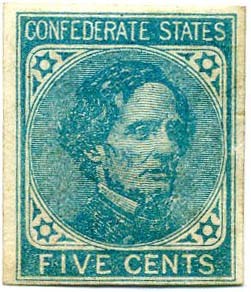 CSA 7-R, 5¢ blue on Richmond paper, used with CHARLESTON / S.C. // MAR / 19 / 186- cds, tiny nick at top, SCV $90 as singles. $100. 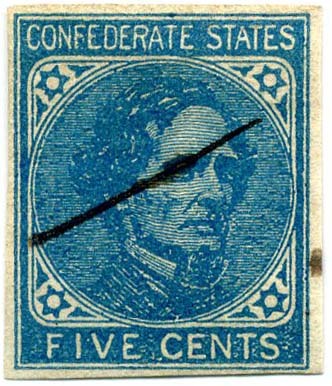 CSA 7-R-v2, 5¢ dark blue on LOCAL PAPER, upper right vertical corner single plus bare trace of BRASS RULE at top, heavy diagonal crease and surface adhesion at left, full original gum, heavy hinge remnant, Scarce, CCV $130 for FILLED IN FRAME variety, plus brass rule LISTED IN CSA CATALOG as 7-R-v4 with “NONE RECORDED” for local paper. $40. 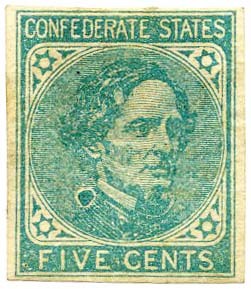 CSA 7-Rb (Scott 7a), 5¢ dark blue on LOCAL PAPER, top sheet margin with full disturbed original gum, Very Fine, CCV $45, SCV $40. $55. 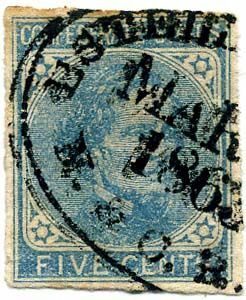 CSA 7-L-v4 / 7-L-v7, 5¢ dark blue on scarcer LOCAL PAPER, both the POP-EYE and FILLED IN FRAME varieties, quite SCARCE with both together; original gum, never hinged, Fine, CCV $65 + $75. $110. 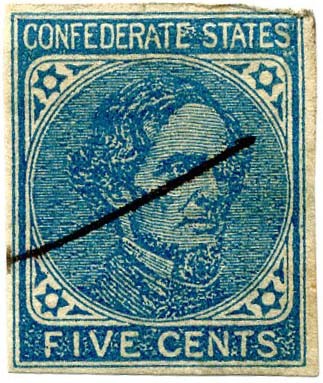 CSA 7-R, 5¢ blue on scarcer THICK LOCAL PAPER (Richmond), unused, Very Fine, SCV $40, CCV $45. $45. CSA Catalog #7-L-v2 5¢ BRASS RULES, listed only at top. This is a stellar UPPER LEFT CORNER BLOCK showing brass rules all the way around, UNLISTED with brass rules at the sides, although clearly logical they exist all around. 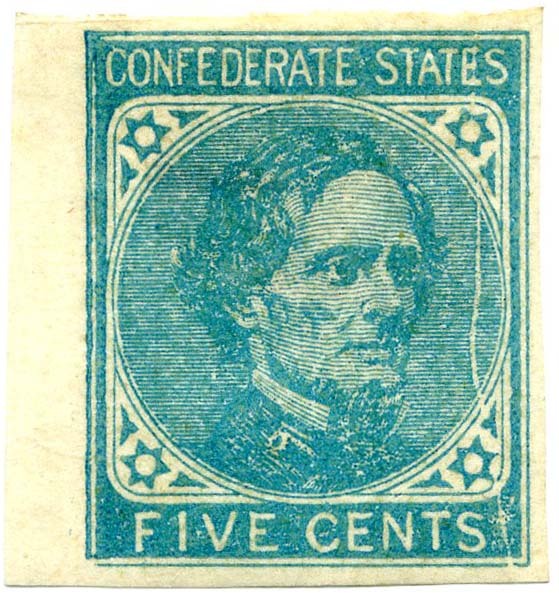 Will be the subject of a joint research article in the 1Q 2019 Confederate Philatelist by Trish Kaufmann and Kevin Andersen. Original gum, never hinged, tiniest tear at left margin, gum creasing, CCV $125 for a single. Spectacular block. $500. 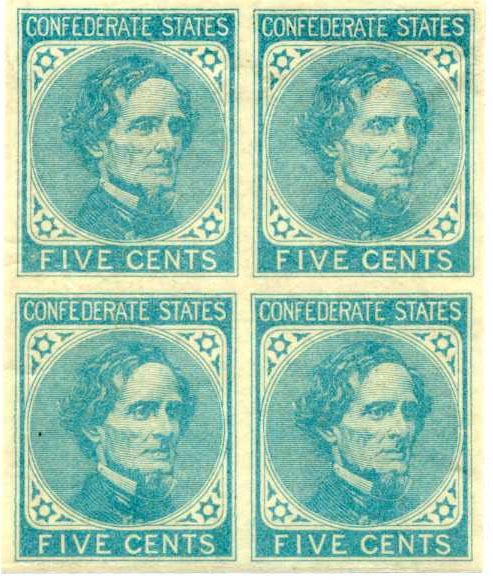 CSA 7-R, 5¢ blue on scarcer THICK LOCAL PAPER (Richmond), Upper Right Corner Single, unused, Superb, SCV $40, CCV $45. $60. 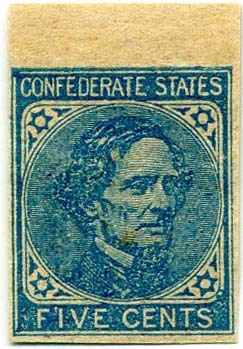 CSA 7-R, 5¢ blue on scarcer THICK LOCAL PAPER (Richmond), Top Sheet Margin Single, unused, small spot in top margin otherwise Very Fine, SCV $40, CCV $45. $40. 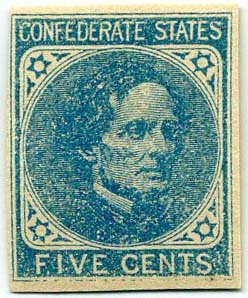 CSA 7-R, 5¢ dark blue on local paper, almost a POP-EYE variety, single used with Richmond cds on piece. $40. 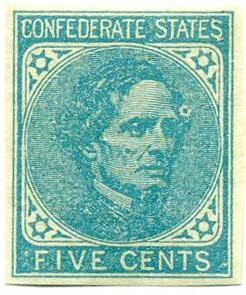 CSA 7-L variety, 5¢ light blue with PLATE SCRATCH CONSTANT VARIETY, original gum, heavy hinge remnant. This variety was recently listed in 2019 Scott Specialized but without pricing. 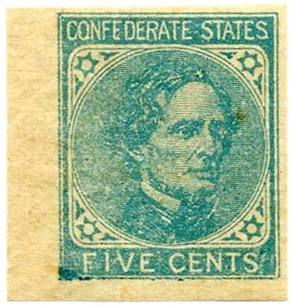 It is also a side subject of an article in the 1Q 2019 Confederate Philatelist mostly dealing with the Brass Rules variety but also announcing this as a constant variety. It is at least as rare as the White Tie variety which catalogs $150. See the articles section of this website. $130.